Summer is the time for getting your legs out to give them an airing unless of course you are a postman in which case you keep them on display all year. 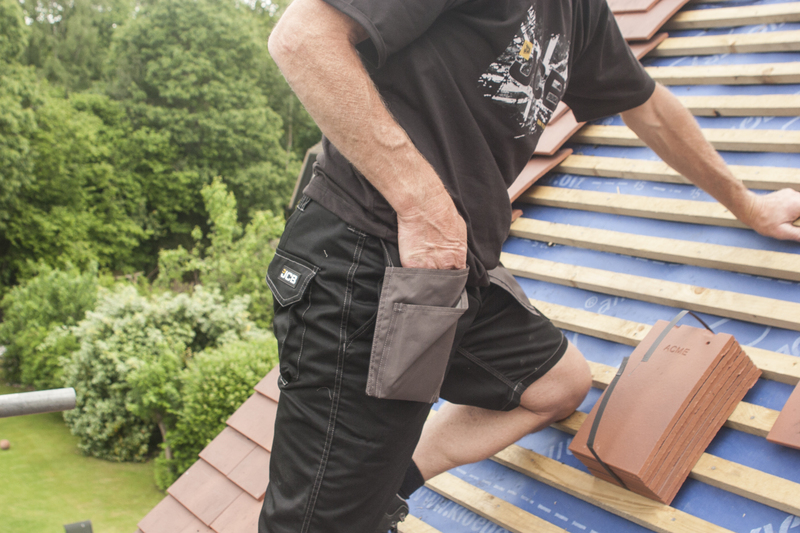 JCB Workwear’s Keele shorts have holster pockets made from a fabric that appears to be water resistant but I think it is merely a hard wearing coating. The shorts are available in black and brown. The holster pockets are permanently out with no provision for detaching them or tucking them in the hip pockets. If you don’t need them, not every trade does, then the only way to modify them is with a pair of scissors. The shorts are generously cut with a slightly elasticated waist band to allow you to move a little more easily. There are two rear pockets with hook and loop flaps to keep things safe and, somewhat unusually, they are big enough to get your hand in so you won’t find it impossible to retrieve your wallet when it is your turn to pay for the breakfasts. The front leg pocket also has a sealed flap and an open section with an array of pencil pockets. There is no specific phone pocket so you will have to work that one out all by yourself. The seams are triple stitched and the pockets are double stitched so they shouldn’t fall apart any time soon. They also have a metal zip on the fly which is always a joy unless you happen to catch your tojjer in it. Take care, pay attention and you will be fine.